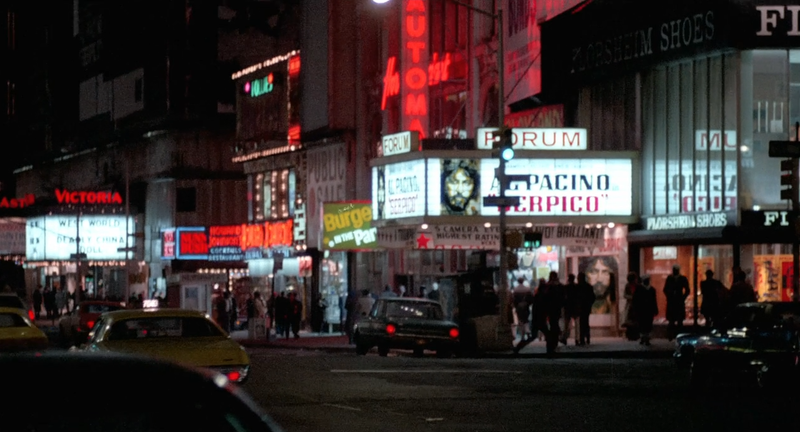 Want to catch a glimpse of Times Square during its seedy period in the 1970s? 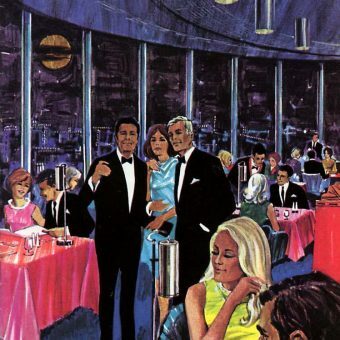 How about Vegas, long after its heyday? 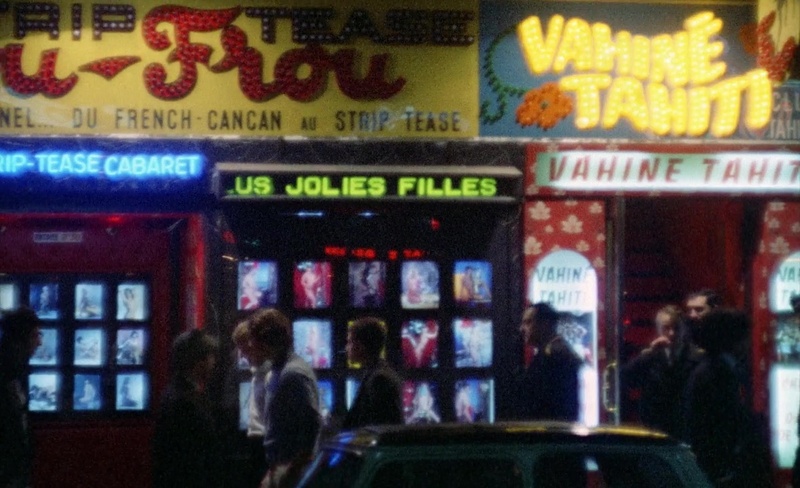 Or an unsavory Soho street circa 1972? There’s no better place to look than old B-movies. 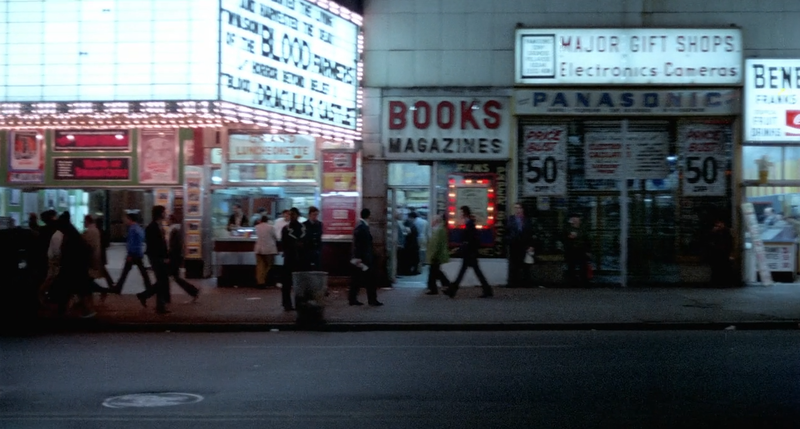 Filming down a “happening” strip was a cheap and easy way for low-budget productions to establish the setting and pad their films. 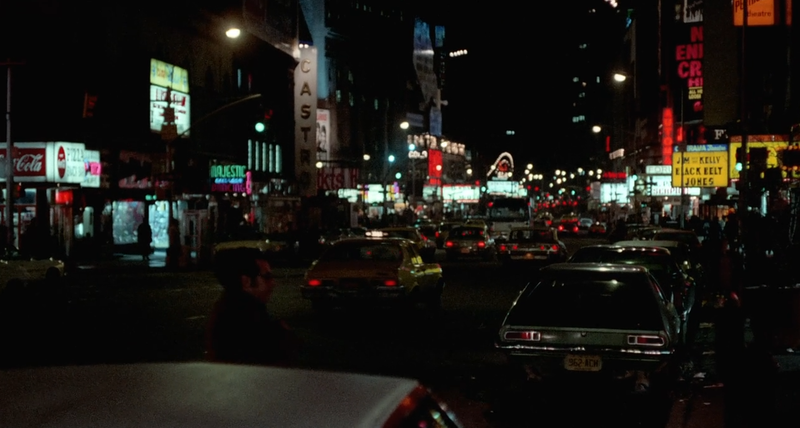 Sure, big budget movies often did the same, but the grade-Z exploitation film is your best bet at catching amazing looks at our city streets back in the day…. 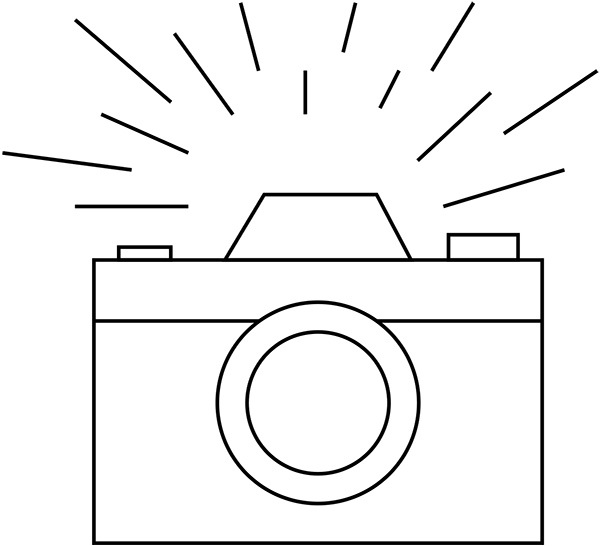 especially when it comes to capturing the seedy side. 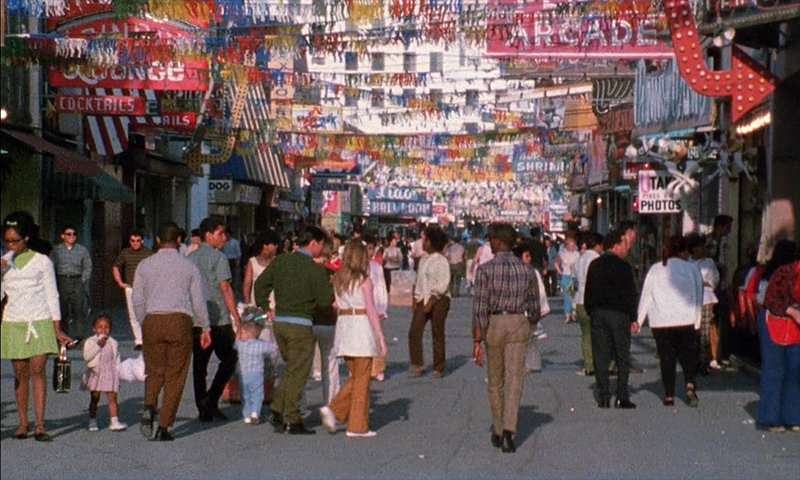 Not all of the scenes below are necessarily sordid and unsavory, but all are great examples of 1960s-1980s city streets captured in cult and B-movies. Enjoy. Endless Night is a long-forgotten German exploitation film about a guy, traumatized by his past, who becomes a murderer. 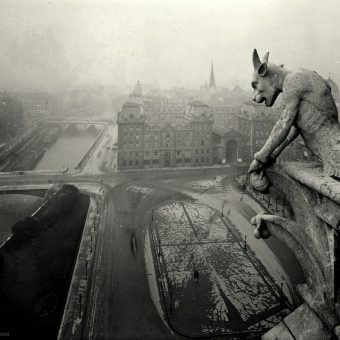 It features some great scenes of an unwholesome side of Paris. Case of the Full Moon Murders (1973) gives some pretty good looks at early seventies Miami, where pretty much everyone looks stoned and unwashed. 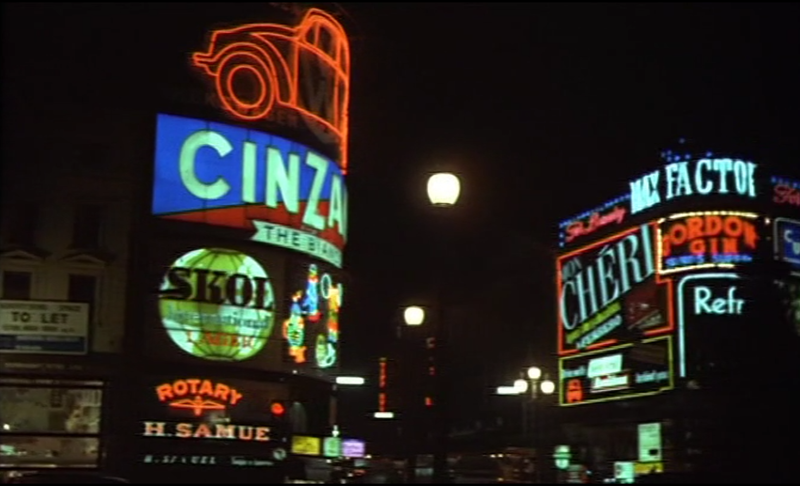 In the British sexploitation film The Girl from Starship Venus (1975) (AKA The Sexplorer), actress Monika Ringwald lands on earth naked, gets clothed and begins to survey the landscape, providing some great shots of Piccadilly Circus. 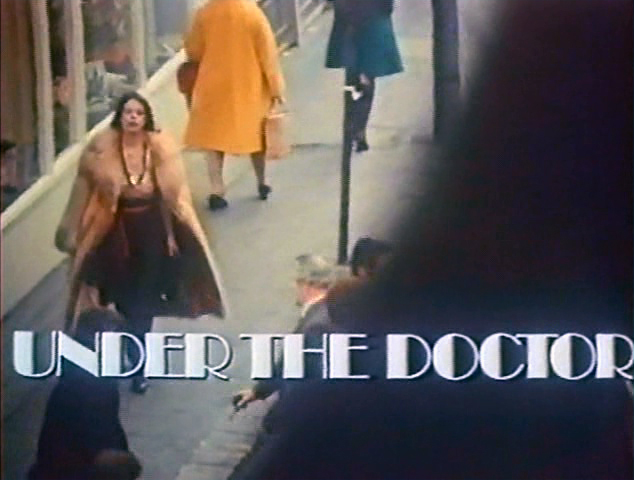 Perhaps the greatest exploitation movie street scene is found in Under the Doctor (1976). In this British sexploitation romp, actress Penny Spencer (Please Sir!) walks down Knightsbridge in a see-through blouse. The reactions of the passers-by are genuine, as they were not aware of the film cameras. 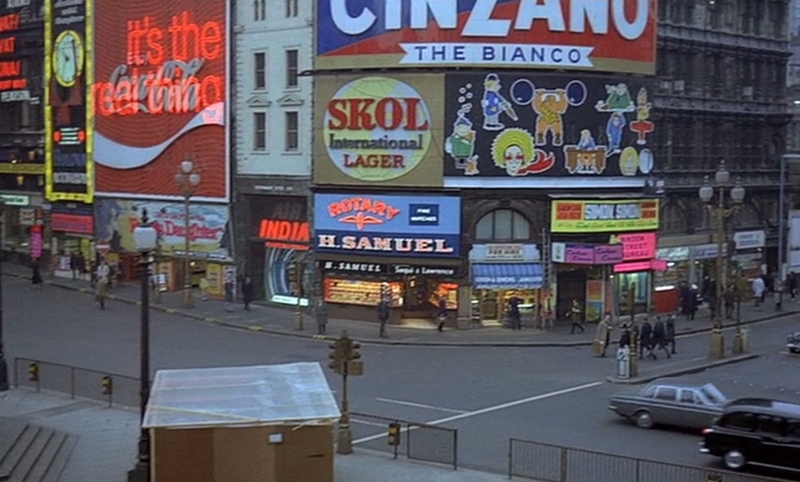 Not only does Spencer deliver some eye candy, but the look at Knightsbridge in the mid-seventies is something special. In an almost identical scene in the Candid Camera film What Do You Say to a Naked Lady? (1970), actress Susanna Clemm walks along New York City streets in her underwear to see if anyone notices. Again, the reactions from the pedestrians are genuine. 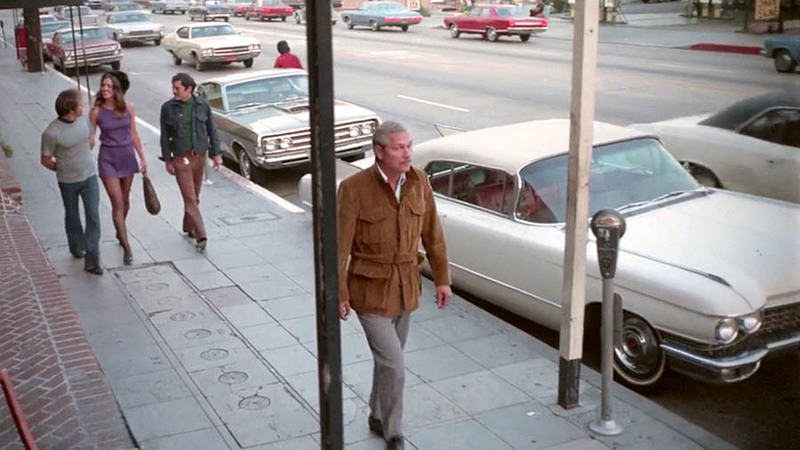 Again, we get an extended look down a busy street back in the seventies. Barbara Crampton and David Naughton patrol the seedy streets of Marina del Ray looking for a missing girl in Kidnapped (1987). Dracula vs. Frankenstein is notable for being Lon Chaney, Jr.’s last film. It featured some cool shots of the Santa Monica pier. 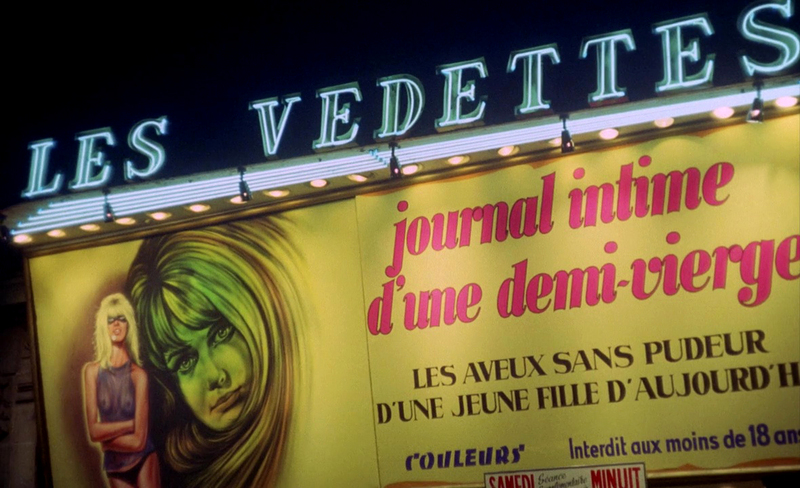 The main character in the film is a vegas nightclub performer (Judith Fontain – her name is actually on the marquee). 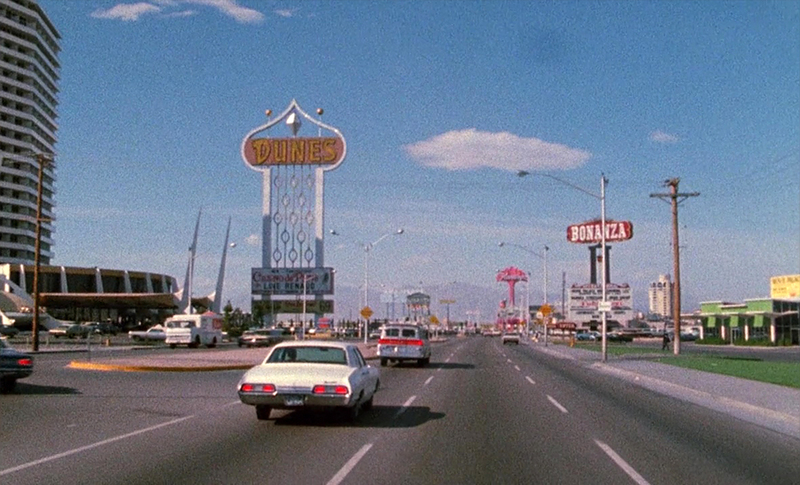 So, we get some nice shots of the Vegas strip circa ’71. You can see the Stardust in the distance. The famous Dunes is on the left. It was owned by Howard Hughes and, in between shows at the Sands, Santra would sometimes perform. The Bellagio now stands in its place. 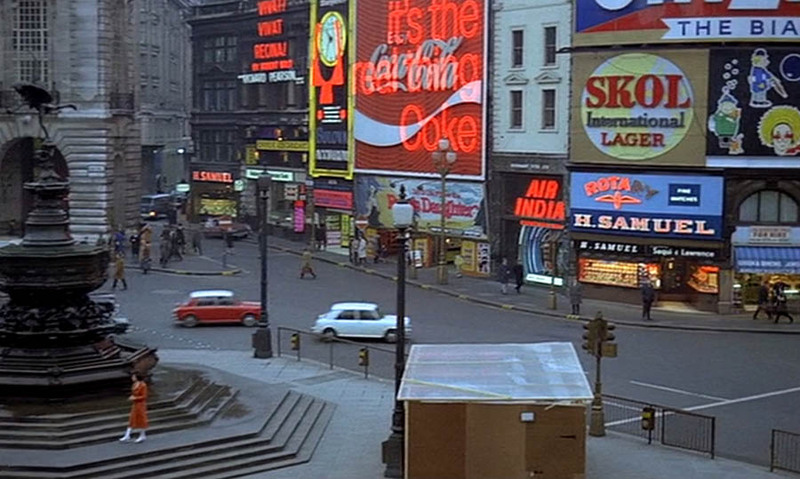 The Dead One in the Thames (1971) (original title: Die Tote aus der Themse), an Edgar Wallace mystery from West Germany, features a really cool shot of Piccadilly. In the British horror film The Virgin Witch (1972), actresses Vicki Michelle (‘Allo, ‘Allo) and Ann Michelle go window shopping down a Wimbledon main street, providing a great look at the local shops. As they cross the street, a random male gives Vicki a pat on the bottom, and they don’t think twice about it. My how times have changed. 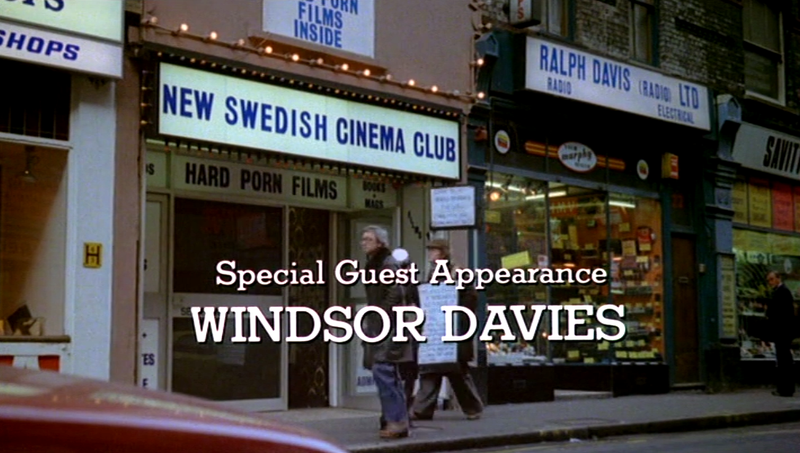 In the Danish sexploitation film, Between the Sheets (1973), the main character walks down the less reputable streets of Denmark to find herself, providing some interesting views of the local “adult entertainment”. 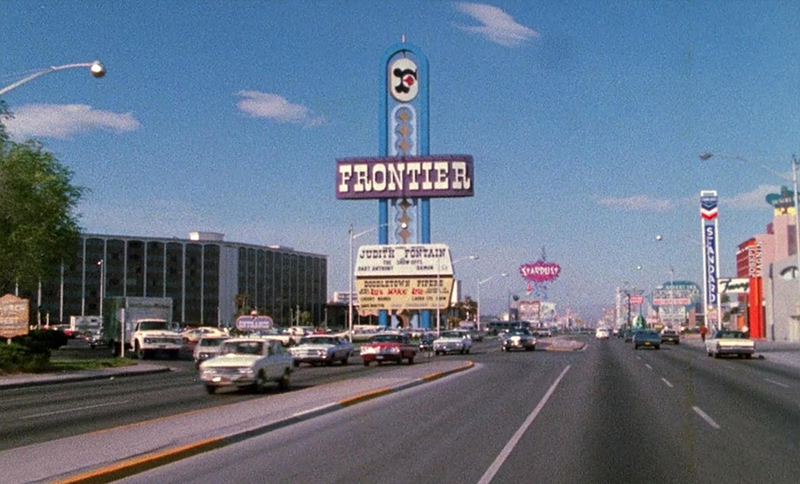 In the hippie exploitation flick Infrasexum (1969) provides some incredible views of the grimy streets of Las Vegas. You get full views of the casinos and shows with plenty of time to soak in the scenery. 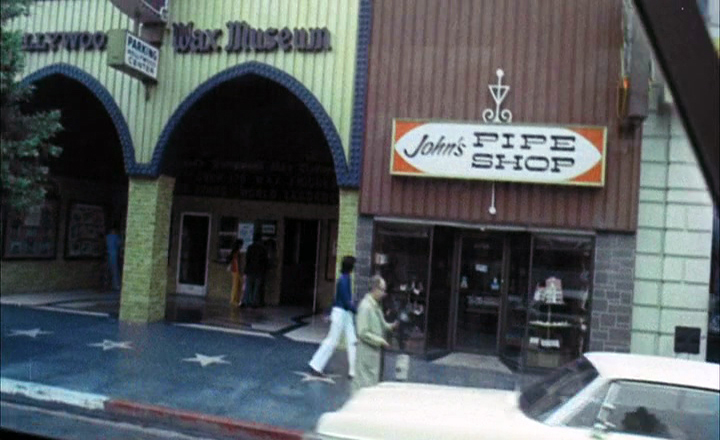 After having his fill of Vegas, the main character heads to California and takes a stroll down Hollywood Boulevard. Infrasexum is just chock full of incredible “padding” featuring long, detailed looks down these city streets. 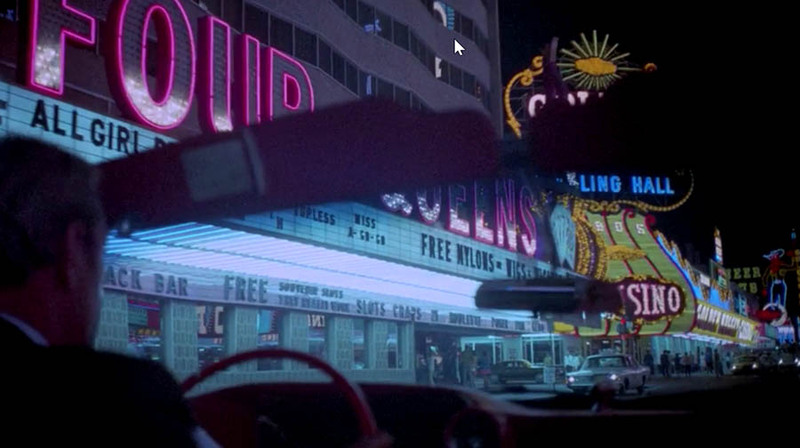 About the only good thing I can say about the straight-to-VHS Las Vegas Bloodbath (1989) is that it provides some nice looks at Vegas streets. Check out the Sam Kinison marquee. 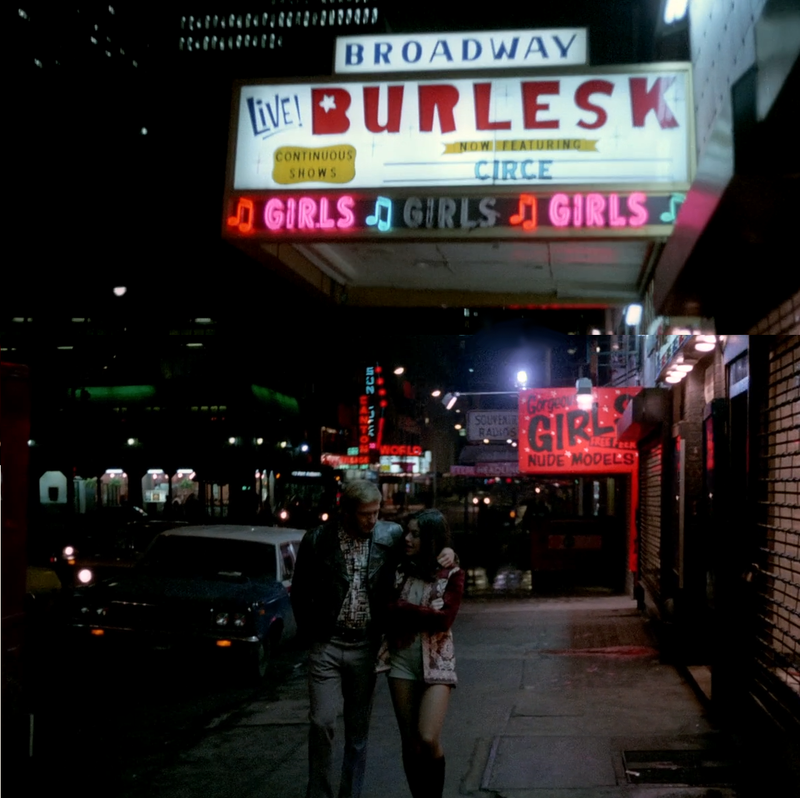 When it comes to capturing 42nd Street and other seedy strips of New York City in the seventies, you can’t beat Massage Parlor Murders. 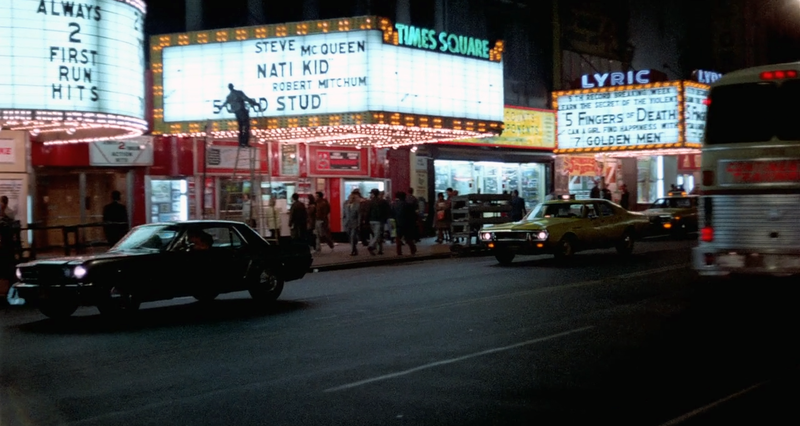 I could pause the tape, and just spend all day looking at the various marquees, billboards and signs for adult entertainment. 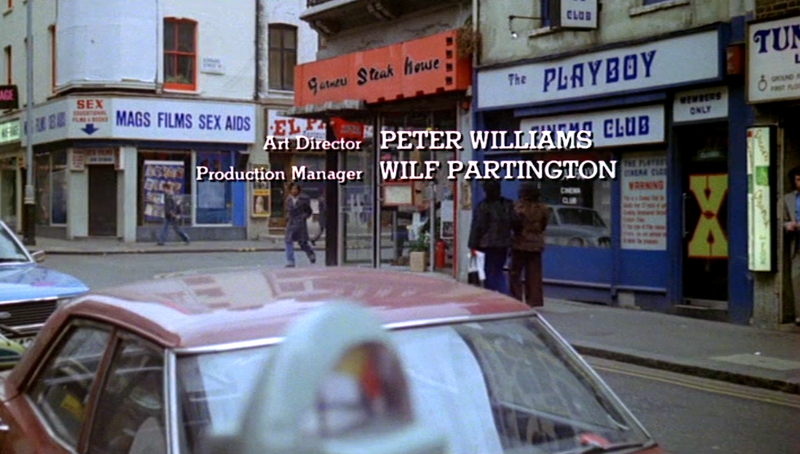 Who can forget the amazing Soho street scene from the title sequence of The Playbirds. 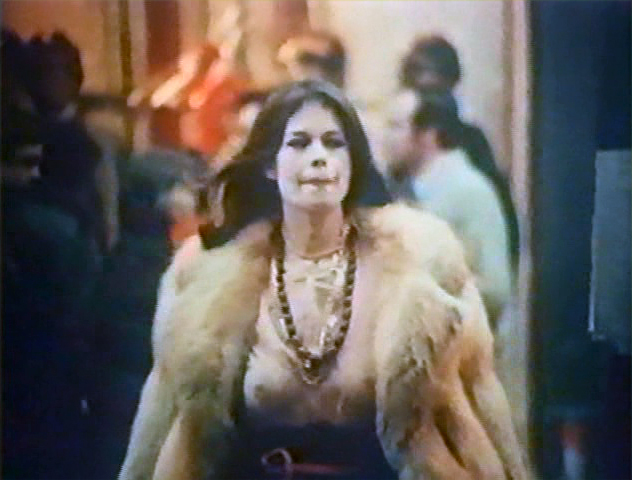 Actress Pat Astley walks down the seedy streets to her apartment, where she’s subsequently murdered. The start of the humorous sexploitation film Alice Goodbody features Alice (actress Colleen Brennan) on a bus looking out the window. She wants to be an actress, and stares longingly at the Hollywood attractions. 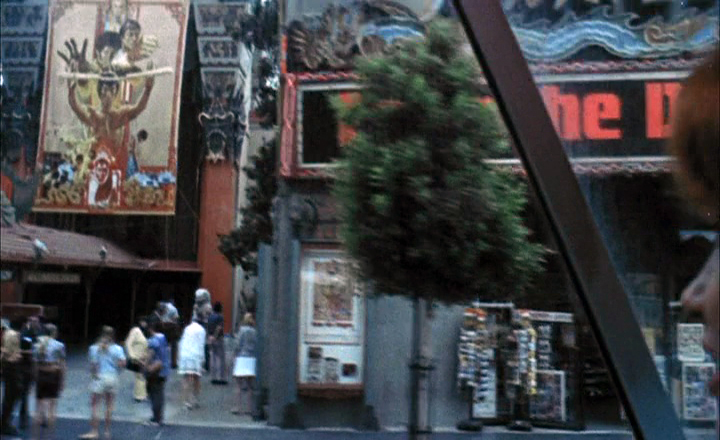 In the shot above, we see the glory of Enter the Dragon being shown at Grauman’s Chinese Theater. 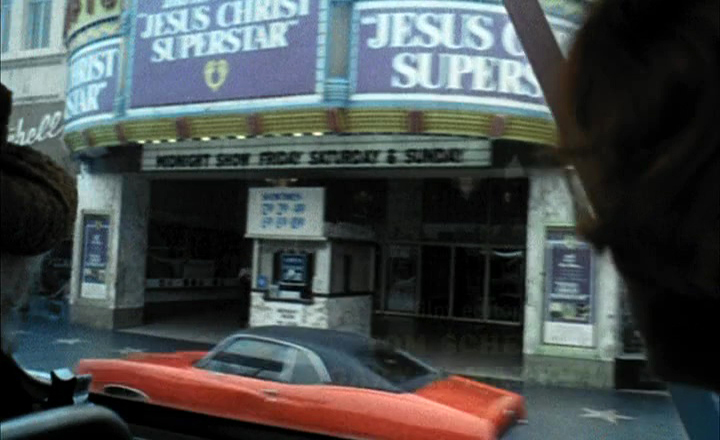 Jesus Christ Superstar appearing at a Hollywood Boulevard theater. In Doctor Jekyll vs. 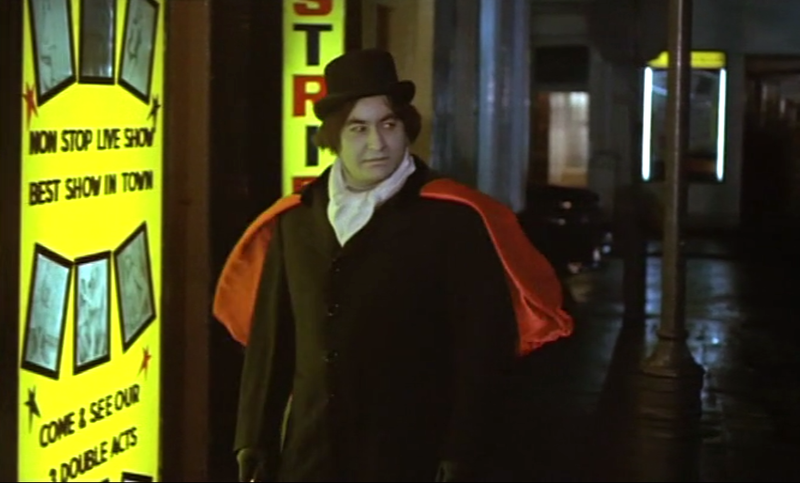 The Werewolf (1972) (Doctor Jekyll y el Hombre Lobo) actor Paul Naschy turns into Hyde and takes a stroll through Soho and checks out a few burlesque shows. 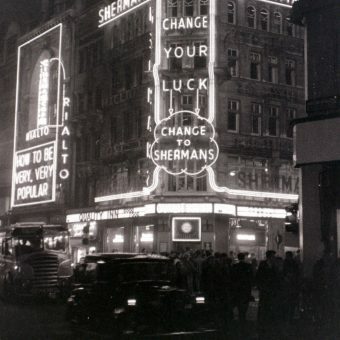 Well, I think Mr. Hyde in top hat and cape jauntily patrolling the streets of Soho is as good a place as any to leave off. Cheers.